These foods may cause cancer. In order to play safe, avoid eating these cancer-causing foods. Here are top 10 cancer causing foods you eat every day and a few you might be buying from the shop or the market. 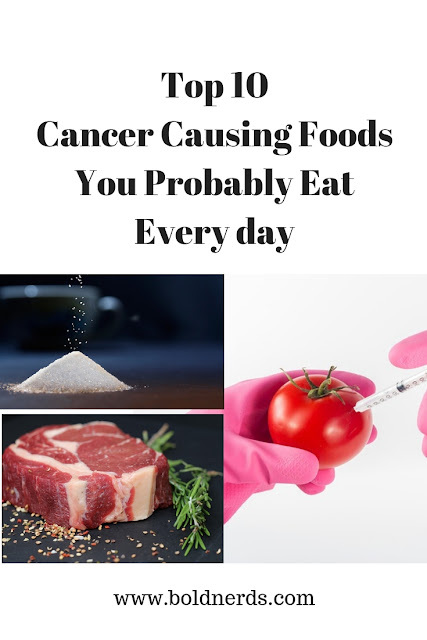 The foods we eat can actually be the major cause of cancer today. You might have improved your health being selective with what goes into your stomach and you must be convinced that you’re making healthy choices when it comes to what you eat? Avoiding sugary foods like snacks and going with sugar-free foods like potato chips might be the start to a healthy life but that’s actually not all there’s to healthy living. Most of the food we eat every day causes many health issues and many of these foods have been tagged as cancer-causing foods. You might think what you eat is nothing bad although you probably eat these foods once every other day. Cancer-causing foods are not just tobacco or the canned foods on our markets today. You could be preparing one yourself on a daily basis without your knowledge. Foods You Probably Eat Every Day That Causes Cancer. You might have heard the rumors about canned foods and how bad they can be for your health. Most canned foods like tomatoes can contribute to cancer development and this is why you must go with fresh tomatoes which has a lot of health benefits. Most tomatoes cans are lined with bisphenol-A (BPA) which is one major contributor to cancer and heart disease. Tomatoes are quite acidic and this seems to attract BPA into the tomatoes itself making it harmful for consumption. Instead of going with canned foods, you can go for alternatives like the ones packaged in sachet, glass jar or simply go for the best alternative which is fresh tomatoes. Although minimal consumption of alcohol can be healthy and has been proven to reduce the risk of heart disease, it shouldn’t be an excuse to keep up with your drinking habit. Alcohol is the second most common cause of cancer which makes tobacco the first. Alcohol is a contributor to breast cancer. Excessive alcohol increases estrogen levels in the blood which is one major contributor to breast cancer. However, you should note that red wines contain resveratrol which has been found to be an anticancer property. This is regarded as the most common cause of cancer and it’s no surprise. Even on your box of cigarettes is has been boldly written that “Smokers die younger” but as a matter of fact, it is quite difficult to quit if you’re addicted. Tobacco smoke is made up of over 7000 chemicals and some of these chemicals are known to be the cause of cancer. People who smoke are at a high risk of contracting lungs cancer and other health problems. So you heard about sugar and its contribution to obesity so in an attempt to lose weight you’ve forgone sugar and substituted it with artificial sweetener to help you lose weight. Well, you’ve just escaped jail for prison. What you should note is that artificial sugar doesn’t stop you from losing weight. It actually helps you gain more weight. Studies say artificial sweeteners could be a possible contributor to cancer. This is because they are made up of chemicals and these chemicals, especially aspartame, breakdown in the body into a toxin called DKP which are a cancer-causing chemical that may cause cancer. Apart from this, artificial sweeteners also make it difficult to control blood sugar. So if you’re obsessed or diabetic and think it’s best to avoid sugar, just avoid it and don’t ever substitute sugar for sweeteners. Oh no! We all know how crispy and sweet potato chips are but why are they included in foods that cause cancer? Maybe frying potato chips at home might not be unhealthy but those on the market cannot be guaranteed as most of them contain artificial flavor, colors and not forgetting preservatives. They are also fried in high temperature that may cause the production of acrylamide which is a known carcinogen found in cigarettes. The popcorn is treated with preservatives and chemicals which can cause lung diseases. Their bags are also lined with perfluorooctanoic acid (PFOA), which has been linked to infertility as well as liver, kidney, bladder, and testicular cancers among others. Cancer cells are known to feed on sugar in the blood which makes the cells grow faster. Without it, cancer cells can’t grow and spread and for this reason, sugar is considered cancer’s favorite food. This isn’t all there’s to do with refined sugar. It has also been considered one of the most common causes of weight gain. Sugar contributes heavily to many obesity causes today. Refined sugars can be found in almost any packaged foods and snacks on the market today. So, the next time you go out shopping, make sure you read the labels. Coffee may have some good health benefits which include the fight against cancer but the roasting of the beans may cause the formation of acrylamide which is a substance that has the ability to interact with DNA. Acrylamide develops when food is cooked under high temperature and for long hours. This is only to say, not only coffee has the potential of forming acrylamides but any other food that gets cooked for a longer period. It is best advised to have a semi-brown dish and this was why the campaign “Go for Gold” was launched by the UK Food Standard Agency. Processed meat or preserved meat which includes sausage, salami, bologna, corned beef, hot dog among others have the potential to cause cancer. These processed meats contain excessive salt, chemicals, and preservatives which includes sodium nitrates, making them look fresh and appealing to consumers. Scientists say these foods are carcinogenic to humans and should be avoided. Genetically modified organisms, GMO’s as its regularly called are modified foods which are mostly grown with chemicals. GMO’s may cause digestive problems as well as liver problems. 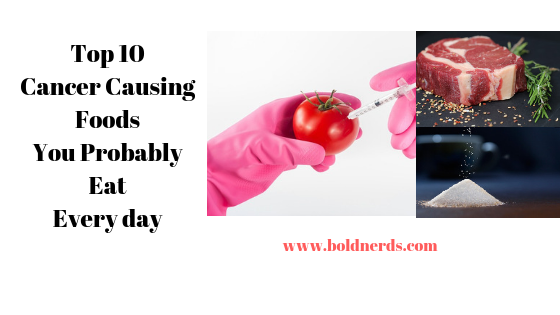 A study conducted on rats which saw rats fed on GMO’s found damaged immune systems, pre-cancerous cell growths as well as smaller brains and livers in just 10days of the project. This is how bad GMO foods can be to your health if you should continue consuming them. Here are 10 most common foods that cause cancer.